« Should The Sisters Sell? Although it was just a two-day test, I thought it would be nice to get into race-season form and attempt to write up a re-cap of the test at Barber Motorsports Park. I say attempt because I wasn’t there, nor did I have access to any more information than anyone else. It’s also an excuse to put together some unstructured rambling. No real surprises: There were few surprises near the top of the speed charts. Team Penske swept the top three spots with Will Power coming away with high honors, while his teammates – Helio Castroneves and Ryan Briscoe, ran the second and third fastest times of the test, respectively. Scott Dixon drove his Target car to fourth quick, while Justin Wilson left Alabama with the fifth quickest time. Newly signed F1 driver Takuma Sato got his season off on the right foot for KV Racing Technolgies by running sixth quick. Mike Conway got his sophomore season underway with an impressive seventh quickest time. The remainder of the top-ten running order was Marco Andretti, Hideki Mutoh and Mario Romancini. Wilson and Mutoh were pleasant surprises as they were both learning new teams. Rookie Romancini also impressed by posting a good number for the woefully under-funded Conquest Racing team. Unfortunately, other than Marco barely cracking the top-ten, the Andretti Autosport stable picked up right where they left off last season – and that’s not a good thing. The remaining AA team placed twelfth (Tony Kanaan), fourteenth (Ryan Hunter-Reay) and sixteenth (Danica Patrick). The remaining three were all outpaced by James Rossiter in a third KVRT car. Read what you want out of these times. It’s sort of like pre-season football. Different teams have different objectives and the times mean nothing more than bragging rights. But, hey – it’s February and we had snow flurries here all day on Wednesday. It’s nice to be able to talk about something on-track. A big “I told you so”: Speaking of snow, Nashville is only three hours north of Barber. If we were getting snow here, you knew it wasn’t balmy down there – and it wasn’t. My dozen or so readers may re-call that in mid-January, I wrote an article chastising whoever made the decision to conduct a test in the southeast in February. The perception of people in the snow belt is that it is always warm and sunny in the south. We southerners know differently. While we don’t claim to be as cold as Buffalo, what the Izod IndyCar teams experienced this week was pretty typical for this time of year. Both days lost time, as the cars were not allowed to take the track until the track temperature was over forty degrees. That didn’t happen until about 10:30 on Wednesday and about noon on Thursday. Practice had been scheduled to begin at 9:00 on both days. I am very happy that the IICS is having a race at Barber in April, but it didn’t take a rocket scientist (or a meteorologist) to know that the chances were very good that it would be cold down there in February. Penske’s new look: Referencing another earlier article I wrote last fall, most know that I was not happy to hear rumors that Team Penske was going to ditch the very familiar and traditional Marlboro paint scheme. To me, it was THE most recognized livery in motorsports – to the point that the word “Marlboro” had not appeared anywhere on the car since 2006, yet everyone knew who the sponsor was. Now that Marlboro has scaled back some of its funding, Team Penske has chosen to adapt a different look. Most who know me, know that I favor the more traditional paint schemes. Some have called my taste boring, but even I find the new look at Team Penske to be a little too ordinary. Penske cars have always carried a classic and tasteful look. From Mark Donohue’s blue Sunoco cars and Rick Mear’s Gould Charge to the famous yellow Pennzoil cars then finally the Marlboro cars – Penske’s cars were always beautiful, yet distinctive. I find this scheme to be just a little plain and not too attractive. They resemble the Newman-Haas Texaco/Budweiser cars of 1995, which did nothing for the eyes. I always loved the tasteful look of day-glo orange on the Marlboro cars, but it doesn’t do much for me in this livery. Each car has different colored end plates on the front and rear wings to distinguish each one. Helio’s car has the day-glo end plates and it makes for a very ugly ride. Perhaps it’s something I’ll grow accustomed to, but they all carry a little too much black for my liking. Maybe they’ll tweak it a bit before the season starts in Brazil in three weeks, but I doubt it. Randy’s priorities: When Randy Bernard sits behind his new desk for the first time on Monday, he is going to have a full day. There are many short-term and long-term problems demanding his immediate attention. To me, his most pressing matter to solve quickly is the Versus-DirecTV issue. It doesn’t affect me directly as I have Comcast and will always have Versus, and in Hi-Def. But it is going to have immediate and long-lasting results on the Izod IndyCar Series if DirecTV subscribers cannot watch three-fourths of the races and qualifying at Indy. This should have never happened in the first place – but once it did, it should have been rectified quickly. This has been going on since August. Each side blames the other but the result remains – Versus is no longer carried on DirecTV. Hopefully, Mr. Bernard can leverage his close ties with Versus and lean on someone to solve this stalemate before the season begins in three weeks. Taking that many eyeballs away from the TV screen makes the IICS a tough sell to sponsors who are already skeptical of races on such an obscure channel. Take the channel away from DirecTV viewers and you have sponsors fleeing the series rather than new ones coming on board. In conclusion: Actually, there’s nothing to conclude – it was a test. We are three weeks away from the start of the new season. It’s about time. Other than 2008, when we saw the two series unified – I’m not sure I can remember a more eventful off-season. There have been several different storylines to follow including all of the talk of the new chassis possibilities for 2012, Tony George stepping down from the board at IMS and shuttering Vision Racing, Danica’s NASCAR debut, a new CEO in Randy Bernard and several driver lineup changes with some drivers still without a chair as the music is about to wind down – most notably Graham Rahal. A lot happened in the week before Barber and a lot more can happen in the next three weeks. Will Vision Racing be able to answer the bell before Brazil? My guess is probably not, but I think we’ll definitely see them at Indy. Will Graham Rahal find a ride before Brazil? Yes, and I pray it doesn’t come with a roof over his head. Although he deserves better, I think his best bet is with Dale Coyne. I am not as big pf a Graham Rahal fan as most. His record is spotty, he shows lapses in concentration but he has improved and we forget that he is still VERY young. I think he may have tasted success at too young an age. Winning in his very first IndyCar race, while he was only nineteen is very heady stuff. It would be only natural for a kid that age to think that it would always be that easy. The last two years have shown him differently. Coyne would prefer a two-year contract while Rahal would prefer just one. Supposedly, Rahal has several sponsor commitments for 2011 and doesn’t want to be saddled with a second or third team when these commitments come to fruition, and I don’t blame him. What about Tomas Scheckter? We haven’t heard much from him lately. Will anymore American drivers join the series in full-time rides? If Helio marries his American citizen girlfriend, will he count as an American driver? It has been a good off-season for Indy Lights drivers. Will anymore get a chance to move up? There are lots of pieces to fall in place over the next three weeks. It’ll be fun to see how it all shakes out. This entry was posted on February 26, 2010 at 4:04 am and is filed under IndyCar. You can follow any responses to this entry through the RSS 2.0 feed. You can leave a response, or trackback from your own site. I wouldn’t expect Bernard to solve the Versus/DirectTV problem. As his PBR has suffered from the same problem of being on Versus and loosing DirectTV viewers. He wasn’t able to resolve the issue for Versus or his PBR, so I’m not sure he’s going to be able to do anything about it from the IndyCar side either. I agree. The issue is to get OFF Versus, not to better distribute Versus (though I get Versus). I really don’t feel bothered that Rahal doesn’t have a ride. Dale Coyne is offering him a spot and it’s his fault if he doesn’t take it. Dale has to run his race team and be profitable while doing it. If Graham won’t sign for two years I don’t see any problem with Coyne taking a pay driver for a year until he can get a solid driver locked down. Fans shouldn’t get upset and blame the league if Rahal doesn’t want to take what is offered. Never forget that racing is also a business. Yep; it’s show business — professional sport. 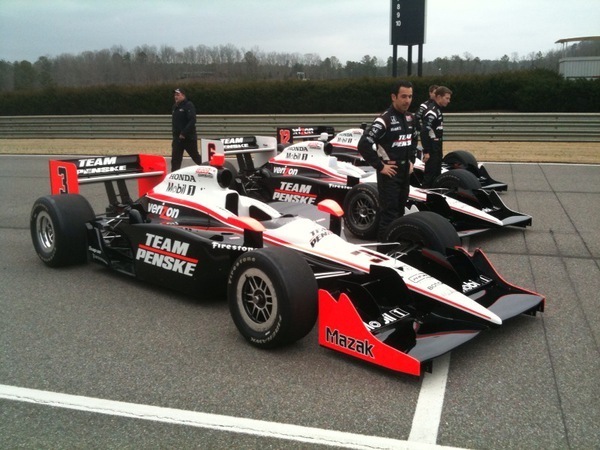 Penske’s new paint scheme reminds me of Newman-Haas when Mario and Michael Andretti were driving for them. I liked the Marlboro-livery cars (and I think the anti-tobacco ad thing is ridiculous), and they were easier to spot on the track. But we’ll get used to it. While I think it’s sad that Andretti might not be *quite* there with regards to Penske and Ganassi, is it so inconceivable the upcoming seasons could actually be the making of HVM and Dreyor & Reinbolt? If their backing is more solid and their new drivers do perform, then they might just be able to make the step up the grid. I think that you are right about Versus. This problem should be fixed, but what can you really do about it? As for TV, the NHL has got to be pissed with NBC for not broadcasting the USA/Canada game on the mother-channel where they had ice dancing or some other fashion show on skates. Frankly, and in my opinion, the NHL should consider if closing shop for two weeks every year is worth the exposure (or lack of it).